Begun life as a high grossing musical comedy film by Paramount in 2003, the story morphed into a Broadway musical in 2015. Although not among the top musicals of all time, the show is a delightful reminder that there is more to school and life than gold-star rewards and meeting other people’s expectations. Now on tour, the show is rocking the aisles of the Cadillac Palace Theatre with laughter and high-energy rhythm. As he works with the students on his strength which is the history, playing and love of rock music, they change. There is also the first impression of the musical itself as it starts out with a “but” and even a “so what” as Finn is kicked out of “No Vacancy,” the band that he started. His problem is that the band is on its way to entering an important Battle of the Bands competition. By intermission, audiences know that Finn is redeemed as his talented class is accepted into the band competition. Directed by Laurence Connor, the touring company appears perfectly cast with Broadway actor Rob Colletti playing Dewey Finn, touring veteran Lexie Dorsett Sharp as school-head Rosalie Mullins, Broadway actor Matt Bittner as friend Ned Schneebly and Broadway’s ‘School of Rock’s’ Emily Borromeo as Patty Di Marco, Ned’s bossy, live-in girlfriend. However, it wouldn’t work if not for the show’s very talented youngsters. They beautifully portray kids whose parents don’t listen to them or consider what they want and need. And yes, the kids really do play the instruments they use in the show. 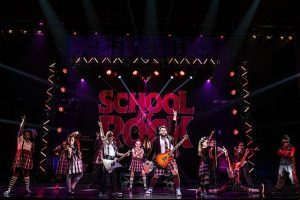 DETAILS: ‘School of Rock, the musical’ is at the Cadillac Palace Theatre, 151 W. Randolph, Chicago, through Nov. 19, 2017. Running time: 2 hours, 20 minutes with one intermission. For tickets and other information call (800) 775-2000 or visit Broadway In Chicago.